Every boy, even some girls, in boating families around the world, wants a boat of his own. One in which he can go off to enjoy himself and have some freedom. He can explore the nooks and crannies of whatever sheltered piece of water limits his travels. He can dream of being a marauding pirate, he can race against his friends or he can sail around aimlessly, simply enjoying the wonderful experience of messing about in boats. This has been possible for many decades in monohulls but not in multihulls. Little Johnny wants to emulate Dad, to follow his lead. If Dad sails a catamaran then Little Johnny would like to have his own little cat. Without one of his own he must sail with Dad on the big one. The big one is just too powerful for his much smaller and weaker body, so he is really along for the ride rather than to sail the boat. There is a definite lack of small catamaran designs that will allow a child to sail with relative ease and safety. The Oppikat was designed to fit into that gap. The Oppikat was commissioned by a production builder which went out of business before even starting mould construction. More recently a South American builder started tooling to put her into production as a GRP boat and work has also started on a South African production version. There are also some one-offs being built in the UK and the Med. She is a small and manageable boat for children to sail either one or two-up as a primer into cat sailing. 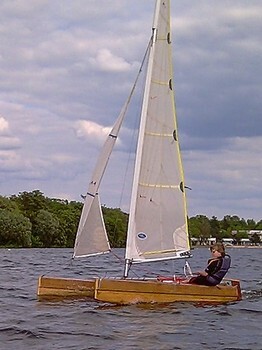 She is also versatile enough to allow father to sail her either by himself or while teaching small children. The size has been set for ease of handling both on and off the water. The 2,75m hull length, 1,7m beam and 4,65m mast length make it a car top boat, without having to dismantle hulls and beams. It will also fit neatly on top of the trampoline of a larger cat. From roofracks to launching will be a matter of minutes and a minimum of fuss. The overall image is thoroughly modern, in the style of the latest racing cats. The keels, moulded integrally with the hulls, will give windward ability and a pivot point for tacking, without the complication of daggerboards. Their draft of 200mm is shallow enough to allow easy beaching and sailing in shallow water. The rudders have simple fixed blades for simplicity. They do not project below the keels so they have protection in shallow water to reduce the number of concerns for novice sailors. The rig uses a simple sleeve luff mainsail fitted over the tubular aluminium mast. The rigging is hooked onto the front of the mast at a cut-out in the sleeve and comprises only a forestay and single shrouds, attached to the chainplates with lashings rather than bottle screws. An optional jib with integral forestay can replace the standard forestay, for higher performance. The mainsail has a large roach and is fully battened. The large foot batten replaces a boom and is controlled by the mainsheet which runs on a wire bridle on the aft beam. Buoyancy material in the double skin top panel of the mainsail will assist with righting in the event of a capsize. This is a fun boat for children on protected waters but they must have proper training in the correct and safe use of a catamaran. It is a benefit of the Oppikat that much of that training can be done with an adult onboard for hands-on teaching. In May 2007 we added new detailing to this design for building from wood. This uses strip cedar with a light glass covering to the rounded bottom and plywood to the topsides, deck and keel. It is built over plywood bulkheads, half of which stay in as permanent structure. This additional detailing turns this into a design that is now well suited to building by reasonably skilled amateur builders. The standard drawing package includes full-size paper bulkhead pattersn with the bulkheads overlaid on top of each other. As an optional extra we also offer full-size paper patterns of the plywood hull and deck panels, with the bulkheads laid out alongside each other, to be used as sacrificial patterns if preferred. In October 2018 we added two precut kit options. The first is a kit of all of the temporary and permanent bulkheads and transoms. The second is a wood parts kit comprising all plywood parts pre-cut, as well as strip cedar for the lower areas of the hulls and the solid timber needed for framing.